The number of books about Lake District walking is so great that other outdoor activities could get lost among them. 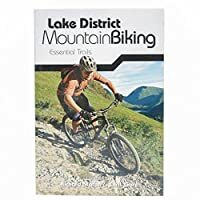 We've therefore created this section to include books on topics such as climbing, mountain biking, kayaking and canoeing, to name only a few. Scroll down to the foot of this page for more about the UK's "Adventure Capital" ... plus a bit of opinionated comment from me about the kind of conservationism that fights to hold back the Lake District from adapting to accommodate the 21st century young and energetic. This beautiful land must be for all ages. There is space for a wide variety of activities and facilities. The Lake District National Park Authority is keen to promote the Lake District as the UK's "adventure capital". What an admirable aspiration, although one development after another that would help this forward gets blocked by so-called conservationists who want to keep everything quiet. As the owner of this web site, obviously a lover of the Lake District and well past my 70th birthday, you might expect me to be in the camp of those who want to block change. Not one bit of it! The Lake District needs to adapt and cater for the young, the energetic and the adventurous as well as for people my age who want to sit back and savour the sound of the breeze in the bracken and the ripples of the river without any intervening "noise" from 20s and 30s enjoying themselves in healthy activity. Roll on the zip wire, says I! The National Park web site above will introduce you to many providers of these exhilarating activities. By all means enjoy fell walking like Wainwright, it's great, but if you're around here for a week and want some variety then here are your opportunities. Sorry there's no mountain zip wire. One day maybe.